After iOS 9 update which arrived on for compatible iPhone and iPad, a rather controversial update soon gets a makeover with the release of iOS 9.0.1 update. 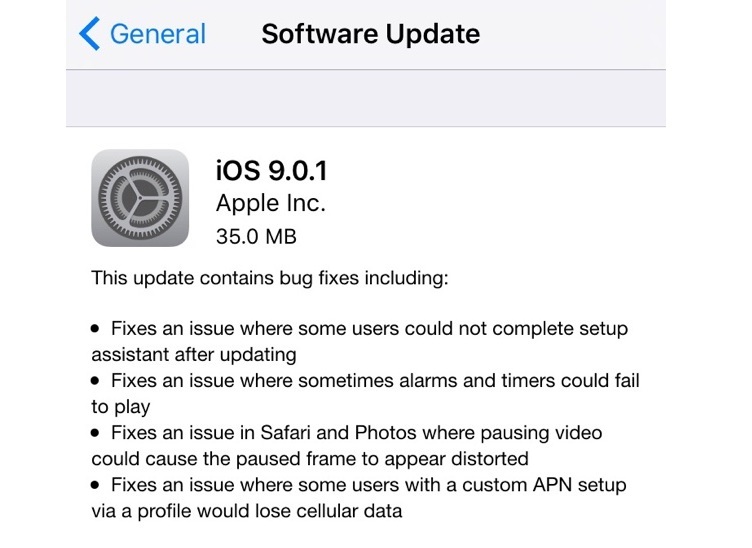 The iOS 9.0.1 update fixes various bugs found on previous versions. The iOS 9.0.1 is available to all the iOS 9 users via Ove the Air [OTA] download. This update also happens to be the first software update to both iPhone 6S and iPhone 6S Plus. As included in all the software updates we have the common bug fixes and performance enhancements included. Fixes an issue where some users with a custom APN setup via a profile would lose cellular data. It’s rather a small update of just 35 MB. Do you see the update available on your device? Do let us know what do you feel.